Unfortunately, not everyone has an easy time putting muscle on their body. For those that have a difficult time gaining muscle - hardgainers - there is hope. The key is to get the right start to your training, to build a strong foundation for further growth. 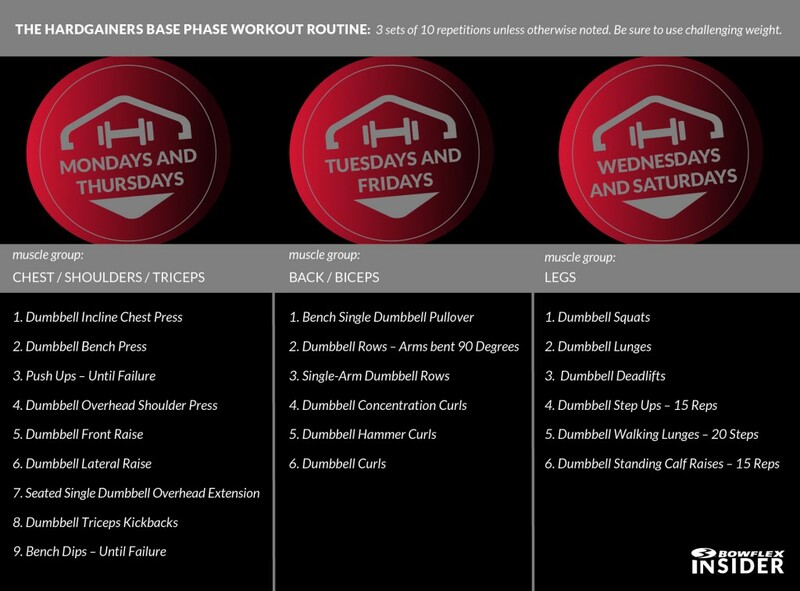 I believe in a base training phase workout for hardgainers that utilizes a 3-day split. This allows you to hit each body part two times per week with one day of complete rest. This phase is a little longer than most, roughly 4-8 weeks, to allow the body to establish the neuromuscular connections that are essential before size gains can be made. It's a straightforward yet super-effective workout that utilizes the tried-and-true exercises. All you'll need for this workout is a set of dumbbells and some determination. If you want to begin your training at home, and you don't have a pair of dumbbells at home already, the Bowflex SelectTech dumbbells are a fantastic option. 3 sets of 10 repetitions unless otherwise noted. Be sure to use challenging weight. Shop now and SAVE on Bowflex SelectTech Dumbbells!